As you can see below, LinkedIn has a lot of information about me. Each dot represents a contact, and each color represents an underlying community with relationships to other contacts in my network. Over the years, I’ve built out several disparate networks of friends from school, colleagues from work and industry, and regional connections. The core question here is what is being done, and more important, what can be done with this data? 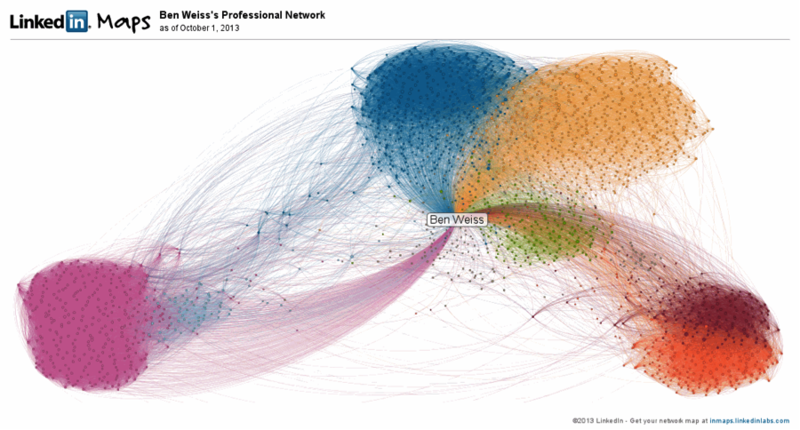 The information and connections gathered from LinkedIn and other social networking sites can be used for a lot more than generating cool, colorful visualizations. This information can be turned into a person’s professional DNA, or core driving predictive behaviors that round out the essence of the individual. At Opera Solutions, we have used this core concept of DNA in the commercial context, where we’ve deployed a Signal Hub at several customers to uncover each individual consumer’s DNA. This enables the company to understand their customers better, as well as improve and personalize the customer experience. Companies looking to hire can use this same approach when trying to know and understand potential candidates. As it turns out, hiring is harder than we thought. Google, for instance, was notorious for grilling candidates on difficult brainteasers to judge intelligence and a candidate’s ability to solve problems on an extremely large scale. Google did a recent study to determine the relationship between these candidates’ scores on such questions and how those candidates ultimately performed in their jobs. There was zero relationship. Google went back to the drawing board to determine what was actually working at the company. It looked at group size; what makes a successful leader; which teams work well together, which ones don’t, and why; how many candidates the company should interview for a given position; which interviewers had more success in finding more successful employees; and the kinds of information that certain questions obtained. This is the sort of inward look companies need to take to determine what kinds of data sources should be included in their Candidate Signal Hub. A Signal Hub for Hiring would house DNA strands from three key elements, namely candidates, culture, and position. Each of these DNA strands could then be used in different applications such as matching candidates to the right open positions, assessing candidate skills against specific skill sets, and identifying common factors among applicants to understand what attracts them to the company. We’d start with constructing candidate DNA. Candidate DNA would largely seek to identify the core makeup of the candidate, namely descriptive Signals, such as intelligence, skills/abilities, loyalty, work ethic, and passion for a specific industry or type of work, as well as predictive Signals that could ascertain the underlying aspirations, goals, and interests of the candidate as well as the strength of his relationships with references, colleagues, and friends. Candidate DNA can be derived from candidates’ social profiles, blog/content sharing, reference data (including first- and second-degree relationships), and any other formal submission data, both structured and unstructured. The core Signals here may include propensity to thrive in a structured environment (based on past roles in corporate jobs as opposed to startups), degree of openness (based on the rigidity of previous roles and reference comments), and comfort level with teamwork (based on previous role descriptions, references, and educational background). Candidate DNA would change over time as the candidate’s interests, roles, and responsibilities change, so it would need to be refreshed on a regular basis within a Signal Hub. Company culture DNA would seek to identify the specific building blocks of the culture of a company at large, as well as the regional, office-specific, floor-specific, department-specific culture that can truly make or break success at the organization (often much more essential than sheer wit or work ethic). This DNA could be derived from a combination of structured data from the company’s employment history and unstructured data from sources such as internal workplace messaging, employee feedback forms, job descriptions, and management insights. Core Signals may include specific characteristics of the firm/office/department, such as work structure, amount of feedback, degree of meritocracy, and social dynamics. Position DNA would seek to identify the core essence of the position itself, including both the variation of required and optional skills required, as well as a deeper understanding of the responsibilities, related hierarchy, and potential for advancement. It can be derived from data sets similar to those in the culture DNA, along with any historical activity data collected around the individual role. Core Signals may include specific characteristics to the job, such as intensity, level of definition, level of responsibility, measurement criteria, skills required, and valuable soft skills that have proven to drive success in the role. Matching the DNA of the candidates, culture, and position should produce a relevancy score that can guide a recruiting process and help interviewers avoid wasting their valuable time with candidates who are not a good fit. The interviewers and recruiters will still be essential to the process, but they would be able to spend more of their time on a candidate’s EQ and the human elements that cannot be easily derived by the machine. Needless to say, the prospects of these kinds of solutions are quite strong as increasingly more companies look to manage their recruiting efforts more intelligently. It’s only a matter of time before such solution sophistication is at their fingertips. For more information on Signal Hubs, click here. You can also get an in-depth view of how Signals work by downloading Signalology, a complimentary white paper that discusses the science behind Signals and Signal Hubs.